The soundboard is the top of the guitar (the part of the body that has a hole). It is also the most important part of the guitar as far as wood choice, because most of the guitar's tone will come from piece. It is almost always a soft wood. I decided to try to order straight from the source (Alaska), to attempt to get the wood at a good price and also to deal with a company that deals directly with luthiers. I spoke with the owner on the phone and he was very helpful and I'm betting that I'll be very happy with the wood. I will put the company name and a link here if I end up being pleased with the wood. I was able to purchase 3 soundboards and bracewood for what it would cost me to purchase less than two from luthier catalogs – so I'm already pretty happy with that. Another board I purchased AA Grade Sitka Spruce. 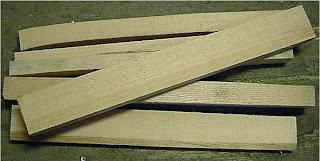 Both of these boards are much higher grade wood that that used on my $400-450 (purchase price) charvel guitar. A Grade Red Cedar the owner said that this was actually a higher grade board but downgraded due to color imperfections... I liked it (purchased this too) and may use it for a classical guitar after this steel stringed guitar build. I also ordered enough brace-wood to do this guitar and maybe a couple additional guitars. Did I mention that I'm already thinking how I would do some things different on another guitar? Should I blog the second guitar? I'm hoping the US Postal service moves quick. The place that the wood is coming from is on an island – so it needs to make a short plane-ride to the main-land, then on barge to Oregon, then through the mail... I may need to be patient – but it also means I'm kinda stuck 'til I get the wood. Hell yes you should blog a second (or third) guitar!